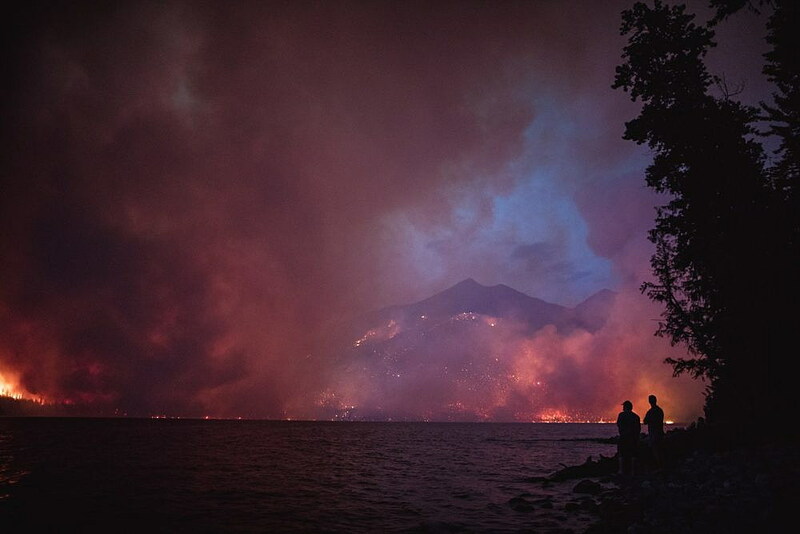 Firefighters are aggressively clearing fuels from the path of a wildfire that’s already claimed a dozen historic buildings, closed Lake McDonald Lodge for the season and half of Going-to-the-Sun Road, prompted evacuations of campgrounds and residences, and obscured Glacier National Park’s world-renowned peaks. In a report Wednesday, John Pierson’s Type 1 incident management team said the Howe Ridge fire is drying out once again after scattered rain showers on Monday and fire behavior is expected to increase as temperatures increase. So ground crews used aerial ignitions on Tuesday to straighten the fire’s northern edge, giving it room to back down the lower slopes of Mount Stanton and creating a thick black containment line. Other firefighters were at work along the Inside North Fork Road, clearing trees and other fuel so the road can be used as a containment line on the fire’s southwest edge. Meanwhile, the wetland at Camas Creek slowed the fire’s march to the west. New structural protection crews have arrived at the fire camp, Pierson reported, and will be deployed to more of the buildings within the fire’s potential path. Already, structural firefighters are at work along the North Lake McDonald Road and at the Fish Creek campground. They’ve also installed high-volume pumps and hoses at Lake McDonald Lodge, should the fire jump the lake or turn around the north end and head down valley. The town of Apgar and cabins between Fish Creek and the town also could be at risk if the fire makes another run in the days to come. Aircraft – helicopters and fixed-wing CL-215s, also known as “Super Scoopers” – are back at work cooling designated hot spots on the fire. The aerial support was grounded Sunday and Monday because of thick smoke. Photographs from several areas of the park on Tuesday and Wednesday showed considerably clearer skies. Updated weather information on inciweb.gov Wednesday afternoon said high pressure is expected to remain over the region through the week, creating warmer, drier conditions. However, a couple of weather disturbances are expected to move through the area, creating gusty winds and increasing the potential for the fire’s spread. The first system is expected later Wednesday, followed by a stronger disturbance on Thursday night into Friday. Howe Ridge is not a wildfire that Pierson’s incident management team expects its relatively limited crew of firefighters to contain. In fact, the estimated containment date for the fire listed on inciweb is Nov. 1. An Evacuation warning is in place from the Quarter Circle Bridge Road north. This includes Apgar, the Grist Road, and all areas accessed from Quarter Circle Bridge Road. A separate evacuation warning is in place for all park areas north of the Bowman Lake Road junction with the Inside North Fork Road due to Whale Butte Fire activity, currently burning on Flathead National Forest land adjacent to the park boundary. An evacuation warning means people need to be ready to leave but are not being evacuated at this time. Road and trail closures: The Going-to-the-Sun Road remains open between St. Mary and Logan Pass. It is closed between the foot of Lake McDonald (near Apgar) and Logan Pass. The North McDonald Road and Fish Creek Road are closed. The Inside North Fork Road is closed from Fish Creek to Logging Creek. Multiple trail closures are associated with this fire. Full trail closures are on the park’s website: www.nps.gov/glac.